Only cast by the Konahrik mask. Summons a Dragon Priest for 60 seconds. Conjure Dragon Priest is an expert level Conjuration spell that summons a Dragon Priest to aid you in combat. 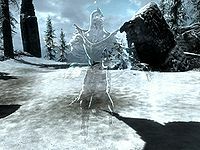 It cannot be purchased or cast, but is one of the spells that may be cast by the Konahrik mask when the wearer is badly damaged. This page was last modified on 3 April 2015, at 19:39.